Founded in 2012, Chili Paste Tour is the creation of Ubon Ratchathani native and Bangkokian of 15 years, Chin Chongtong, who is also the main guide and cooking instructor. The company takes its name from the English translation for nam prik, a vast genre of Thai relishes made by pounding with a mortar and pestle. A tiny bit of nam prik provides a huge punch of flavor, making it a staple in non-wealthy Thai homes going back many centuries. Nothing epitomizes Thai food quite like chili paste. Chin spends nearly all of her time exploring, studying and experimenting with Thai cuisine. 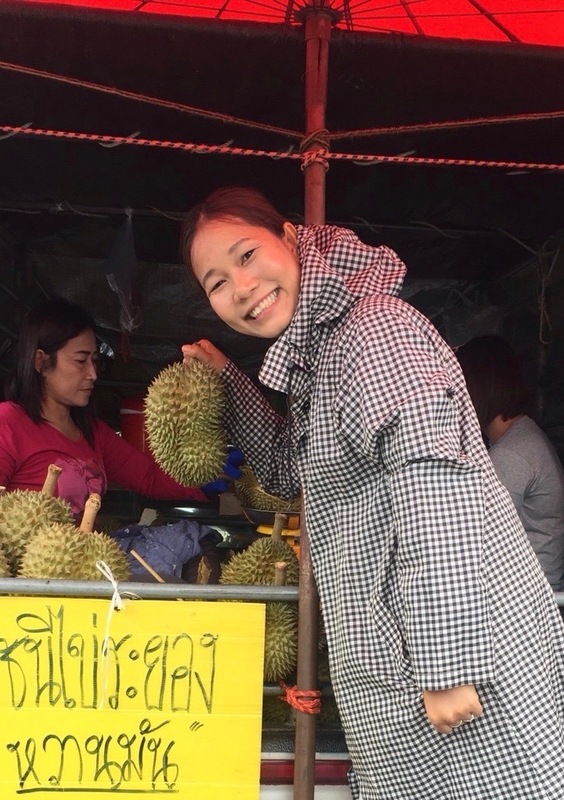 In her own kitchen, at country farms, at Bangkok’s street stalls, markets and anywhere else where people are serious about food (just about anywhere in Thailand), Chin can be found tirelessly searching for the best and most interesting ingredients and flavors. With a sharp palate that tends towards the sour rather than the sweet, Chin feels that MSG and mass-produced seasonings are taking Thai food in a worrisome direction. Her penchant for obscure ingredients has shown time and again that a roadside weed can taste terrific. Though she doesn’t shun new ideas — indeed she often comes up with her own progressive culinary creations — she is naturally devoted to preserving the roots of Thai food. In the countryside, Chin loves to visit farms to meet and understand the people who produce the raw ingredients of Thai food, and the land that fosters it. In the city, she seeks out and befriends people who devote their lives to perfecting just one or two dishes. As a child, Chin’s mother and grandmother taught her to forage for wild herbs, mushrooms, fish and frogs in Northeast Thailand, instilling in her a profound respect for nature. As a guide, Chin aims to be professional while also keeping things fun and relaxed; one guest remarked that she’s more like a host than a “proper” guide. She hopes you’ll feel like you’re being shown around by a local friend who happens to be an expert on Thai food. As a cooking instructor, Chin cuts no corners while teaching you to prepare dishes that you may not expect, using local ingredients that many people have never encountered. Above all, Chin cares deeply about the local communities that she frequents, which is evident in her friendships with the locals themselves. Chin’s tours and cooking classes have often been repeatedly recommended by travel and food writers, including Thailand travel blogger guru Richard Barrow and the authors of Thailand’s Best Street Food and Anne’s Kitchen. Guests’ online feedback has also been overwhelmingly positive. Chili Paste Tour is a legally registered Thai company with all necessary licenses for conducting tours in Thailand.